Home > News Articles > Upgrade! Our mobile app just got even better. We’ve added new features to our mobile app! Instructions for using the new features are shown below. To learn how to set up Mobile Banking for your Signal accounts, see our Services page or view our Mobile Banking Quick Guide. 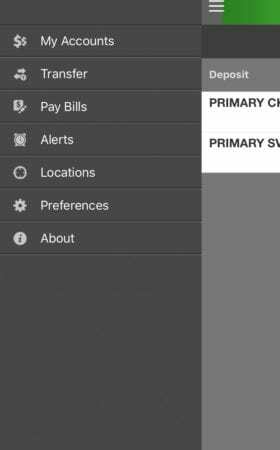 To view details of other accounts in the mobile app in addition to checking and savings, first log in to eBanking in a web browser and click on the Options tab. Click the Mobile Settings link in the gray bar, go to Web Mobile Settings, and then check the boxes for any accounts you want to be able to access through the mobile app. Click Submit to save your choices. These accounts will then be included in the list of your accounts on the app. Please note that while Signal Financial does not charge members to use the mobile app and online banking services, standard carrier and data charges do apply to all mobile banking services. Check your carrier agreement for more information. 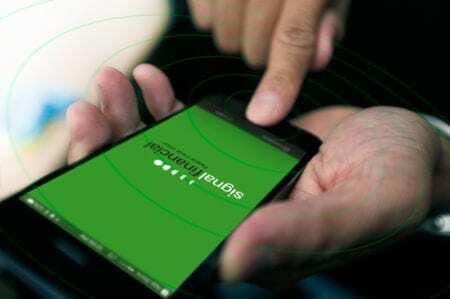 2 These features must be set up in eBanking to make them available on the app. For questions, contact our Member Services department at 301-933-9100, ext. 298 or via secure message in eBanking. More information is also available on our Services page. 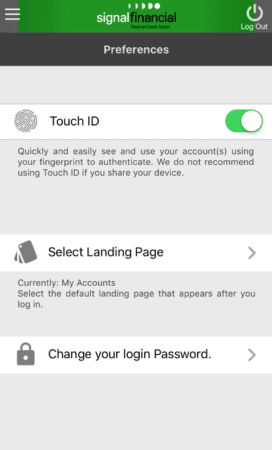 If you are using our mobile app on an Apple™ device with Touch ID™, you will be automatically prompted to enable it. 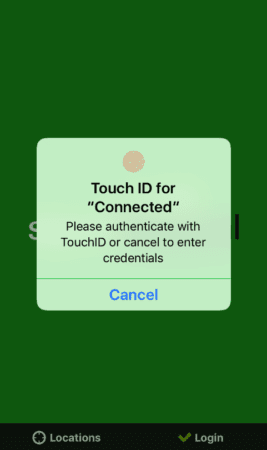 If you do not have Touch ID™ enabled on your device, please check your device’s settings. 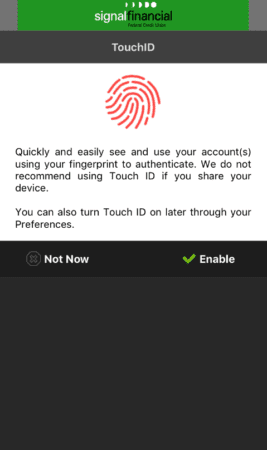 Once successfully enabled, you will have the option to access your account through the Touch ID™ feature. 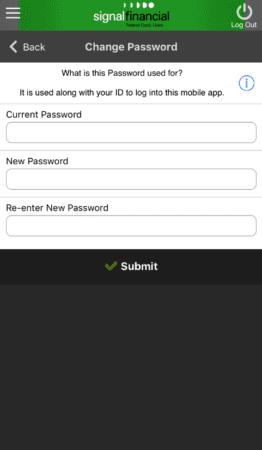 With this upgrade, you’ll now have the ability to change your account password through the app. To do this, go to “Preferences”. Then, select “change your login password”. You will then be given the opportunity to change your password. When you’re done, tap “submit” and your new password will be active.